Being "one of the last giants of music" as Hindemith described Reger, his works are still unnecessarily seldom featured in concert programs today. 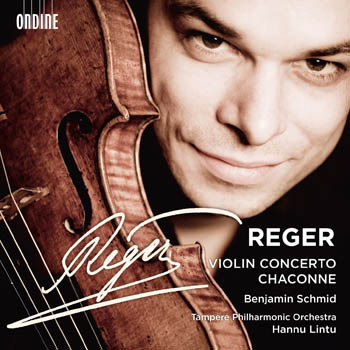 This release invites to listen to a captivating performance of Reger's Violin Concerto, a hugely charming big romantic work with broad sentimental gestures. Also the composer himself felt extremely confident about the work as he wrote: "I know this sounds arrogant, but I believe that this violin concerto will follow in the footsteps of those of Beethoven and Brahms." The CD winds up with a virtuosic Chaconne for Solo Violin, Op. 117/4, a work inspired by Reger's greatest idol Johann Sebastian Bach. In 2013 Ondine will release Ligeti's Violin Concerto with Benjamin Schmid, this time with the Finnish RSO and Hannu Lintu.